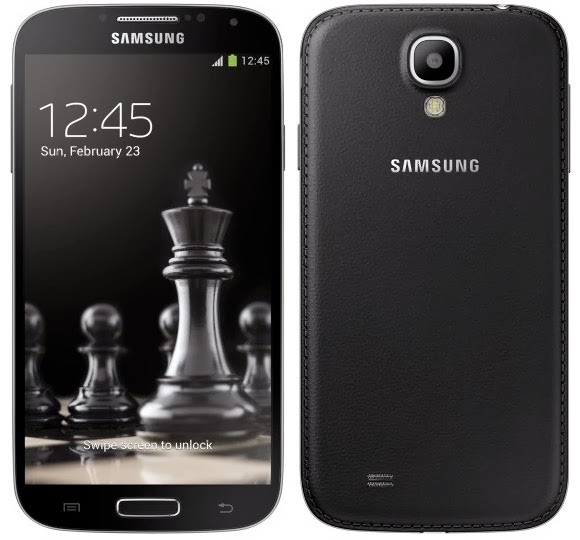 Samsung announced the Galaxy S4 and Galaxy S4 mini black editions. They look similar to the regular versions of the Galaxy S4 and S4 mini, but feature a black faux leather back cover that is similar to the one used on the Galaxy Note 3. Galaxy S4 Black Edition is powered by Qualcomm Snapdragon 600 SoC with a 1.9 GHz quad-core Krait 300 CPU and an Adreno 320 GPU which based on the I9505 Galaxy S4. Other hardware details are the same, and include a 5-inch full-HD screen, 2 GB RAM, 16 GB internal storage, 13 MP camera, Wi-Fi, LTE, Bluetooth 4.0, NFC, DLNA and a 2,600 mAh battery along with Android 4.2.2 Jelly Bean. The Galaxy S4 mini Black Edition is the same hardware features of the Galaxy S4 mini, which include a 1.7 GHz dual-core Snapdragon 400, 1.5 GB RAM, 8 GB internal storage, 8 MP camera, micro-SD slot and a 1,900 mAh battery all in 4.3-inch qHD screen. The Galaxy S4 Black Edition is going to launch in Russia next month for $660 and the Galaxy S4 mini Black Edition is set to cost $460 in the country.